8th edition preconstructed decks contain 40 cards and a strategy insert. Released in 2003, 8th edition is a core set. The set contains 357 white-bordered cards (110 rare, 110 uncommon, 110 common, 7 fixed, and 20 basic lands). The seven fixed cards only appear in the core game pack. 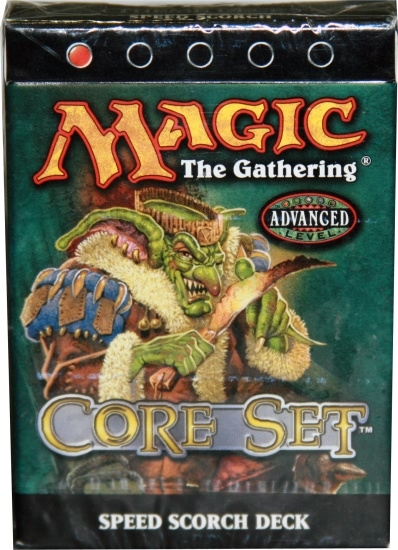 8th Edition or Core Set was the standard base set for the collectible trading card game, Magic: the Gathering from its release until 9th edition's release in 2005. Its expansion symbol is the number 8 with 3 cards behind it. Eighth Edition was set to be released to coincide with the 10th Anniversary of Magic the Gathering's original release, so the creators took a different approach to the base set. Every previous expansion had at least one card reprinted in Eighth that had not been reprinted in the base set before, with a series of votes on the Wizards website deciding what got reprinted. Eighth was also the first base set with a pre-release card (though some claim it was a 10th Anniversary card, not a pre-release). Eighth features many cards from older base sets and expansions. While many of these cards were very powerful during their original print run, some are not quite as powerful in newer tournament settings. Several tournament staples which had appeared in 7th Edition, including Opposition, Llanowar Elves, Counterspell, and Duress, were not present in Eighth Edition. Some of these cards were very famous and had been with the game since its inception, and their removal caused controversy among some players. However, the release of the newer "M10" Core Set has attempted to re-release several of the cards that were iconic with earlier players, including the aforementioned Duress. The Circle of Protection series, a perennial core set entity, remained in the set but changed from common to uncommon. A number of very simple cards, such as Vizzerdrix, were reprinted only for products directed at new players and were not present in booster packs, a refreshing change to many players. Eighth Edition, as with its predecessors, does not feature any mechanics that were not present in previous versions of the base set, despite the reprintings from other sets. However, some abilities from previous versions of the base set were absent, including Banding.